What are the benefits of a bamboo pillow? It is a common question arise in the mind of the buyer of a bamboo pillow. Undoubtedly, we can not describe the benefits of a bamboo pillow in a single word. So keep reading until the last word of the article to learn in details about the pros and cons of bamboo pillow. 6 Few important quest​ions about bamboo pillow? 6.1 Is Bamboo Pillow Costly? 6.2 Where Can One Get Bamboo Pillows? 6.3 What is a Bamboo Pillow Made Of? After a long day at work, you look forward to getting a good night rest. However, it can be challenging if you are not getting one. Many people invest a lot by purchasing sleep products to enable them to sleep soundly at night. These products do not always solve the problem. In most cases, people buy new mattresses thinking it is the one causing the problem but the challenge remains. Without a proper pillow, you will continue experiencing sleep problems on your bed. Therefore, look for a comfortable pillow such as a bamboo pillow that will support your body posture while sleeping at night. And it is the most practical benefits of a bamboo pillow. When you hear the word bamboo pillow, the first thing that comes to mind is how can a tall green tree make a comfortable pillow? You may visualize a green pillow with hard shoots or a green leafy pillow. Well, this is not the case. Just as the name suggests, a bamboo pillow is made of bamboo fibers. We all know that bamboo is a tall tree, and it produces hardwood. The tree is left to grow and then cut and harvested. The raw products are then treated with chemicals to become pliant threads. The threads are then woven to form bamboo pillows among many other products. You may wonder if the pillows are green. The answer is no. After an intense process of changing the bamboo’s raw material into a soft sustainable fiber, the finished product is hardly green. These types of pillows are very sustainable. People suffering from allergies can use bamboo pillows since they are hypoallergenic. Such qualities make the bamboo pillows very marketable and trendy in today’s world. So the bamboo pillow has immense benefits. Many industries are manufacturing bamboo pillows since the trees are abundant and grow fast. For instance, you can grow bamboo to maturity, cut and harvest the raw product then leave it to re-grow again. What’s more, the bamboo final products are user-friendly. Outlined is a detailed guideline of the benefits of a bamboo pillow. Take few minutes to adjust. It may come as a surprise that bamboo has natural and very powerful antibacterial properties. This quality makes the bamboo durable. As mentioned earlier, you can grow, cut and harvest the raw products and leave it to regenerate. This ability is due to the presence of antimicrobial properties. The bamboo has a fighting bacterium called Bamboo Kun. It enables the tree to resist bacteria attack and thus the bamboo fiber stays sterile all the time. During the extracting process of the fiber, the antimicrobial properties are reserved in the fiber. Since they have unique ability to fight bacteria, the fibers will stay sterile and fresh for a very long time despite being a finished product. This attribute will not change even if you wash the bamboo pillow many times. We all know a pillow absorbs your sweat at night and thus causing a smelly odor with time. The antimicrobial properties in the bamboo pillows help to absorb sweat and thus odor free. You will always remain fresh and cool as long as you use a bamboo pillow. Are you allergic? Try using a bamboo pillow. They are hypo-allergenic in nature. Such an attribute helps the bamboo fiber to repel dust mites. The pillow also resists molds and mildew. Therefore, allergic people will never suffer from allergies concerning dust and molds. By using a bamboo pillow, you will remain safe and healthy for a very long time. In addition, bamboo grows naturally and does not require any form of chemical to grow. Such attribute enhances its hypoallergenic nature. This may come as a surprise to you that bamboo has a cooling effect. A bamboo tree is naturally cool to the touch. The bamboo fibers contain micro-gaps as well as micro-holes. This unique attribute enables bamboo pillows to absorb moisture easily. As mentioned earlier, bamboo pillow also absorbs sweat from the user. As mentioned before, a bamboo pillow contains micro-holes as well as micro-gaps. These micro-structures give the bamboo pillow to natural ventilation. Therefore, regulate body temperature by keeping the user cool all night long. This attribute also enables the pillow to be breathable in nature. Furthermore, bamboo is natural fiber and this enhances its cooling effect. In addition, the micro-structure nature also traps warm air in the fiber during a cold season. Therefore, a bamboo pillow user will stay warm even when the weather is cold. Bamboo trees are environment-friendly in that, they grow naturally without using any form of fertilizers or chemicals. They can grow with little water, unlike most plants. That is why bamboo trees are planted in areas where other trees or plants cannot thrive. This amazing ability is what makes bamboo sustainable as well as environmentally friendly. Due to bamboo pillow’s unique traits such as hypoallergenic, micro-structure nature, and antimicrobial properties, they are good for people who suffer from respiratory ailments. These attributes reduce the high chance of getting respiratory ailments such as asthma. 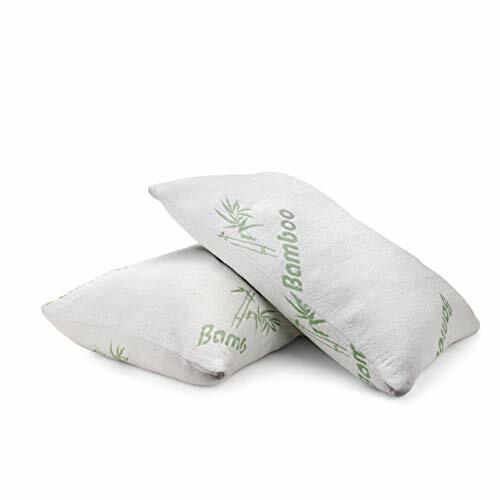 Bamboo pillows do not cure snoring rather they help by reducing snoring. The bamboo fibers are comfortable, breathable, flexible, and soft in nature. The pillow will adjust to your sleeping style by adapting your sleeping posture. This in return, reduces all attributes that cause snoring such as neck pain and poor circulation of air among others. Bamboo pillows are full of memory foam that adjusts to the contour of your neck, shoulder and head thus favoring every type of user. The pillows are flexible, soft and comfortable and thus suit every type of sleeper. As mentioned earlier, the bamboo fibers are shredded to become pliant. Whether you are a side sleeper or a stomach sleeper, this attribute will make the pillow adjust to your sleeping posture with ease. Apart from the various designs manufactured to suit every type of sleeper, bamboo pillows come in different sizes. You can choose from available sizes found in the market. All these different sizes are important for users. They are manufactured to suit every user’s needs. Despite the various sizes, the pillows are designed to adapt to every sleeping style. We all know pillows contain fillings, bamboo pillows are no exception. They contain shredded memory foam. The fillings are easy to shape and thus adjust with ease to the body’s contour. The fillings’ adjustable quality makes the bamboo pillows the ultimate pillows for all types of sleepers. As mentioned above, bamboo pillows contain shredded memory foam fillings that adapt to one’s body contours while at sleep. At times, the manufacturers mix the memory foam with a softer fiber such as poly-fill to make the pillow softer. A bamboo pillow can have fillings enclosed in a zipper cover to allow the removal or addition of the memory foam fillings to suit your need. At other times, the pillows contain fully enclosed fillings and do not allow a person to remove or add more fillings. Such type of a bamboo pillow will adjust to your sleeping style. Many people find it easier to travel with a bamboo pillow because of its malleable nature. The pillows contain soft shredded fillings that enable the pillow to compress easily and thus do not take much space. You can fold it or roll it tight to fit in your suitcase. That is why they are the favorite pillows to carry with you while traveling. Most people who use bamboo pillow claims they smell like fresh paint. It is a normal occurrence for a newly designed bamboo pillow to have an off-gassing smell. The memory foam fillings cause the smell, which is a man-made fiber. However, with time, the smell will fade in time. If the nasty smell affects you, you can always air the pillow for a few hours per day. As mentioned earlier, bamboo pillows are made from bamboo material. The tree is organic in nature and it does not need any type of chemicals or fertilizers to grow. They also contain amazing natural qualities such as antimicrobial among others that are only found in organic plants. That means that the bamboo pillows are also organic despite undergoing an intense preparation process. The organic nature makes the bamboo eco-friendly. Few important quest​ions about bamboo pillow? Majority of people wonder if bamboo pillows are costly. The answer is yes. Bamboo pillows are made from a natural eco-friendly plant and this makes it expensive. They range from $30 to $150. In addition, the process of converting the raw product into a finished product involves intensive labor. This also contributes to the high price. Where Can One Get Bamboo Pillows? If you are in need of a bamboo pillow for personal use, you can find one at the supermarkets or stores. However, there are wholesale stores that sell in bulk. They are readily available in different sizes and shapes. What is a Bamboo Pillow Made Of? We all know that there are two sides of any pillow: the cover and the fillings. A cover can be made from organic cotton, polyester, cotton or bamboo blend. In our case, a bamboo pillow is made from the raw products of bamboo and they are shredded to make pliant threads. A pillow can consist of the following types of fillings: wool, cotton, buckwheat, latex, memory foam, down filing and poly-fill. In most cases, bamboo pillows consist of memory foam fillings. At times, there is a mixture of memory foam and poly-fill to make the fillings soft as a feather. It is worth noting that there are no bamboo fillings. Steeping- The bamboo pulp is immersed in aqueous sodium hydroxide in order to swell the fibers and convert them into alkaline cellulose. Pressing – The alkaline cellulose is then pressed to achieve the exact ratio. Shredding - The pressed alkaline is then shredded mechanically into fluffy particles. Aging - This process involves reducing the alkaline cellulose to achieve a viscous solution. Xanthation – here, the alkaline cellulose is converted into cellulose xanthate due to a reaction caused by carbon disulfide. Dissolving – This process, the cellulose xanthate is mixed with the aqueous caustic solution to convert it into pure viscose. Ripening – just like the name suggests, the viscose is left to ripen. Filtering – the viscose is filtered to remove any un-dissolved material that can cause a defect. Degassing – The process involves the removal of entrapped bubbles in the viscose to avoid causing a weak spot in the fiber filaments. Spinning – The process involves spinning of the viscose rayon. The viscose is dipped into a number of chemicals to achieve elasticity that is needed for an effective spinning process. Drawing – The process involves the stretching of the rayon filaments and thus they align well across the fiber axis. Washing – The viscose rayon material is washed to remove salt and other water-soluble impurities. Cutting – The viscose rayon is cut to produce the required length of material. Before purchasing a bamboo pillow, you need to know a number of things beforehand. For instance, what are the benefits of a bamboo pillow and are they adjustable? You should also ask yourself what size of the bamboo pillow would suit your sleeping style. With these thoughts in mind, you will be able to purchase a bamboo pillow with ease. By now you know bamboo pillows contain memory foam fillings, which is a man-made material. The memory foam fillings are enclosed in a tight package and are unable to breathe. In return, there is an emission of an off-gassing smell. However, the smell will fade with time due to the circulation of air once you start using it. Since bamboo pillows are adjustable, the process involved is messy. The removal and installation of the fillings may seem easy but it is not. First, you need a big zipped bag to place the fillings once you remove them. If you decide to throw them away, you may need them in the future. You should also adjust the fillings in an open-air space due to the static nature of the fillings. However, this occurs only when the memory foam is mixed with other types of fillings. It may come as a surprise to you that the memory foam fillings in a bamboo pillow are heavy. Despite the attribute, the pillow conforms to your body with ease. When it comes to washing, the memory foam fillings break easily. You should avoid washing the pillow unless a need occurs. The best way is to use a dryer to freshen it. This does not mean the bamboo cover is not washable because it is machine washable.To learn in details, please read 'Miracle Bamboo Pillow Washing Instructions'. Whether it is an adjustable or a non-adjustable bamboo pillow, they both take time to adjust as per your need. You will keep removing and refilling the adjustable bamboo pillow until you get comfortable with it. The non-adjustable pillow will take time before it adapts to your sleeping body that is the head, shoulder, and neck, but eventually, it will still adjust just fine. Do not worry. You can re-fluff the bamboo pillow easily by your hand or placing it in the dryer for around 15 minutes. A good night sleep requires a quality pillow such as a bamboo pillow. With the various benefits such as hypoallergenic and microbial properties to mention the least, it is obvious that bamboo pillow will suit your needs. In addition, the pillows come in different sizes to suit every type of sleeper. For these reasons and many more, purchase a bamboo pillow for a night of quality sleep.